It’s not new information that all relationships go through tough spots at some point or the other. Some of the star signs are easier to be in relationships with others and with these particular four, it is definitely much better. Even the best of relationships can go sour with a slip of the tongue. Those who are patient, humble and empathetic are better at keeping relationships together because they know that it is important to talk to their partners and work hard to keep everything together. Relationships depend on many factors and all of these need to be taken into account if you want yours to last. If you ask anyone who is in a relationship that has been going strong for many years, they’ll tell you that it takes a lot of hard work which needs to be done day in and day out. Both partners need to be mature if they expect to be able to handle all the challenges and obstacles that will come their way. Those who aren’t won’t be fit to deal with the complications that will come their way. Relationships can build you up but they can also tear you down. There’s plenty of stress involved and not of all us are equipped to deal with that. Many fall apart under all the burdens they need to carry both mentally and physically. For these reasons, quite a few prefer to get into more casual arrangements that don’t go on for too long. They just can’t see anything beneficial about sticking to one person for the rest of your life. Maybe they find it easier to be spontaneous rather than steady and consistent. Also, time and context really matter if you want to judge whether a relationship is likely to be successful or not. Both parties need to be in a good space at the moment so that they can think about making a serious commitment. It is essential that they’re willing to open up their lives as well as their hearts to each other. Of course entering into a relationship with someone who was born under one of these four-star signs doesn’t automatically mean that you will have a lasting and loving relationship. You’ll just have a better chance of being successful because they have the traits of people who can keep their relationships going. Thought it is not easy to find the person who is best for you, you can take comfort in the knowledge that that person is somewhere out there waiting for you. You just have to be patient and keep yourself open to all possibilities. 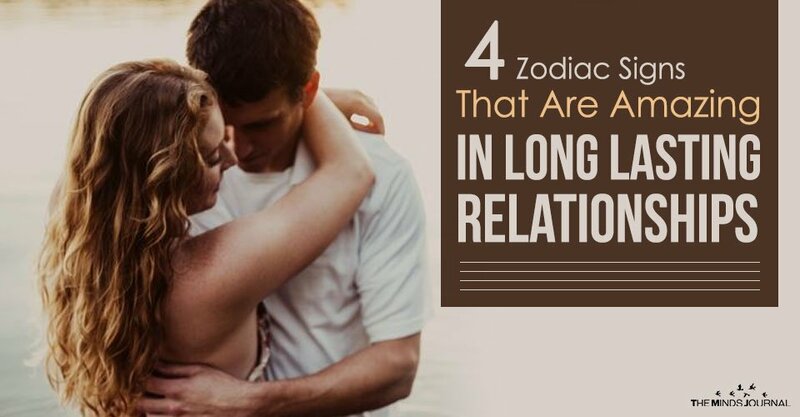 Below are the signs that you need to watch for if you’re looking for a relationship that will work out in the long run. If you’re with a Taurus, you can rest assured that you are with a partner who is not lacking in consistency and steadfastness. They can be trusted to keep their word at all times. Known for being resilient and reliable, Taurus is well aware that a lot of work needs to be done for a relationship to be successful and they’re willing to put in that and more because they won’t be happy with something that is just average. They will never let the sun set over their anger and whatever issues crop up during the day have to be solved then and there. Due to their preference for a balanced and symmetrical lifestyle, they’ll do their best to ensure that everything stays that way.